Present perfect progressive definition: The present perfect progressive tense (also called the present perfect continuous) is an English verb tense that is most often used to express actions that began in the past and continue to the present. What is the Present Perfect Progressive? The present perfect progressive is a complicated English verb tense. It is a combination of the present progressive verb tense and the present perfect verb tense. The present perfect progressive verb tense most often expresses actions that began in the past and continue to the present. 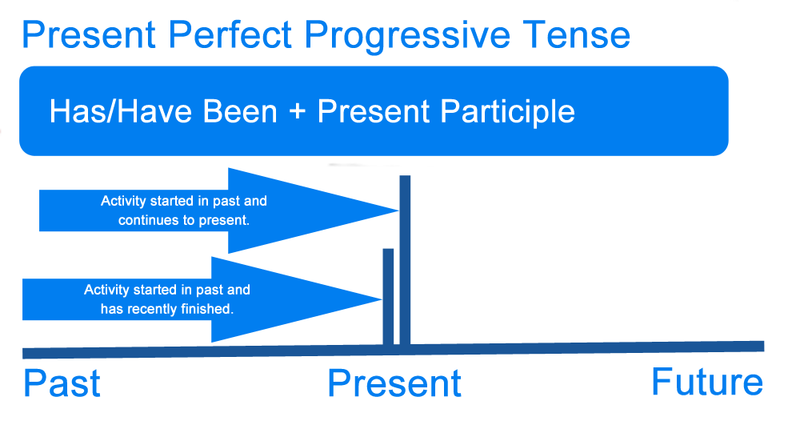 Here is a depiction of what the present perfect progressive tense describes. As you can see, an event or action begins in the past and continues up to the present. The water has been running all day. In this example, the running water is the action that started in the past. It continues to the present because it is still running (nothing stopped it). I have been working on my essay all weekend. In this example, I started working on my essay at some point in the past, and my work continues to the present. The present perfect progressive verb tense is relatively easy to form because its components remain fairly consistent. The present perfect progressive is most often used to express actions that started in the past but continue to the present. This means that the action itself began in the past. However, it continues to the present and has not yet stopped. It is still occurring as the sentence is written or read. The sirens have been blaring for hours. The blaring sirens are the action that started in the past. This action continues to the present because nothing has stopped the action. It is a continuous/progressive action in that it keeps going. It can also refer to actions that started in the past but just recently stopped. She has been sleeping all day and is now ready to go out. In this example, she is no longer sleeping. This action, however, has current relevance because it is why she is now ready to go out. Recently, I have been watching a lot of television. This example shows that the action is a new habit but has been happening often. The action is not necessarily happening now. This example is similar to the prior one, but it is in the form of a question. The speaker is asking whether or not the other person has recently picked up the habit of working out. Typically, dynamic verbs are used in sentences with the progressive verb tenses. Stative verbs do not really work in the progressive tense because the progressive tense explicitly expresses actions. A dynamic verb is a verb a subject can do. A stative verb expresses a state of being. They have been liking their new appliances. We have been being creatively lately. Because progressive tenses express an action, it is best to use dynamic verbs. Define present perfect progressive: the definition of present perfect progressive is the English tense used to describe continuing actions starting in the past that continue to the present. used to express action that started in the past and continues to the present. 1 What is the Present Perfect Progressive?